If you don’t have a valid driver license in California, we strongly recommend that you take the steps to getting it reinstated. For some, this may require taking – and passing – a traffic school online to have points reduced. For others, there may be more extenuating circumstances that may need to be addressed, like checking out Caltrans. California is a big state, spanning about 164,000 square miles. That said, if you need to make a longer trip, say from San Francisco to San Diego, it’s more than just a hop down the street. There’s where the likes of planes and trains can come in handy. California is home to several large, international airports that can make getting up and down the coast a breeze. There are major airports in San Diego, San Francisco, Los Angeles and Anaheim, among others that can help you get from big city to big city quickly and often affordably. If you fear flying or airfare is just too much for your budget, another ideal option is the light rail train system. 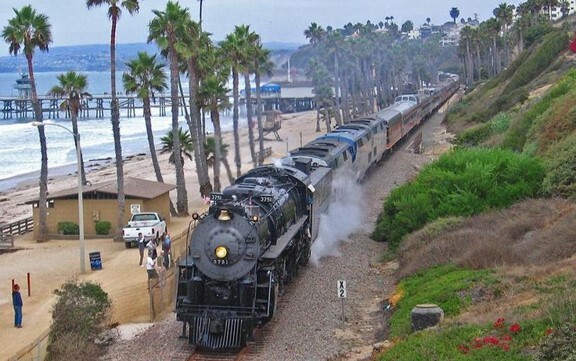 The train literally runs up and down the coast, from San Francisco to San Diego. California also has a nice Amtrak rail system, so that too can be an option for getting around from place to place. Most of the big cities, such as San Francisco and Los Angeles, have public bus transportation offering to help people get around town. While these buses are on fixed routes and don’t travel outside of the city limits, they do offer an option for someone who just needs to get from their city apartment to their downtown office, for instance. One of the nicest things about ride sharing services like Uber and Lyft is that they’re more affordable than a taxi cab and they’re on demand, so you won’t have to call and wait for one to pick you up. However, if you’re taking an Uber or Lyft on a daily basis, the costs are still going to add up over time. Try to think of ride sharing services as a temporary solution to getting around California without a license. Yes, they’re cheaper than a taxi cab, but they’re still far more expensive than most public transportation offerings. If your destination is only a few miles away, we’d encourage you to take advantage of the nice year-round California weather and get some exercise in the process by either walking or biking to your destination. The big cities tend to be more walkable, as everything is packed in more closely together. Like we noted in the opening, while it is feasible to get around California without a car, the size of the state and spacing between major cities can make it difficult without a viable vehicle. That’s why we encourage you to do what’s necessary to get your license back if it’s been suspended or you haven’t renewed it. Try to think of the options we’ve listed above as temporary solutions until you can get back behind the wheel of a car. For more information, contact us today.